In some cases Troi Activator 4.5 will crash when disabling the plug-in or when installing a new version. Below you find instructions to manually remove version 4.5 and install a newer version. Note that you only need to do this once. 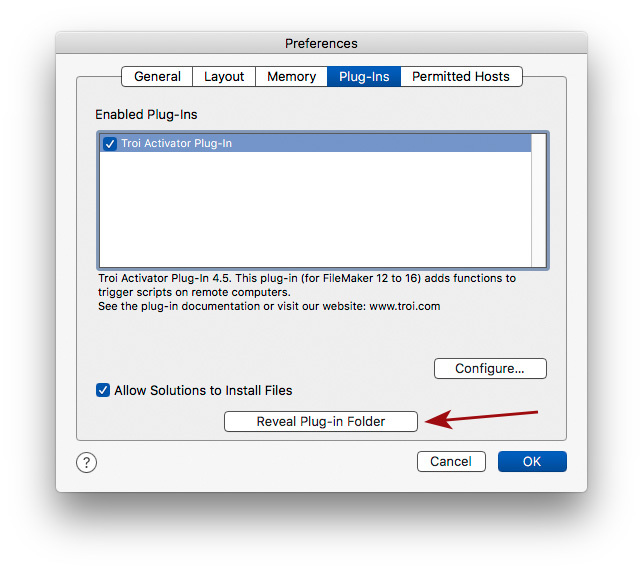 Before you start, download the latest version of Troi Activator Plug-in first. Go to Preferences –> Plug-ins. Click on “Reveal Plug-in Folder” button. This will show the folder in the Finder. Go back to FileMaker Pro and click on the “Cancel” button. Then quit FileMaker Pro. Go to the Finder of Mac OS. From the “Go” menu navigate down to “Go to Folder”. Finally click on the Go button. 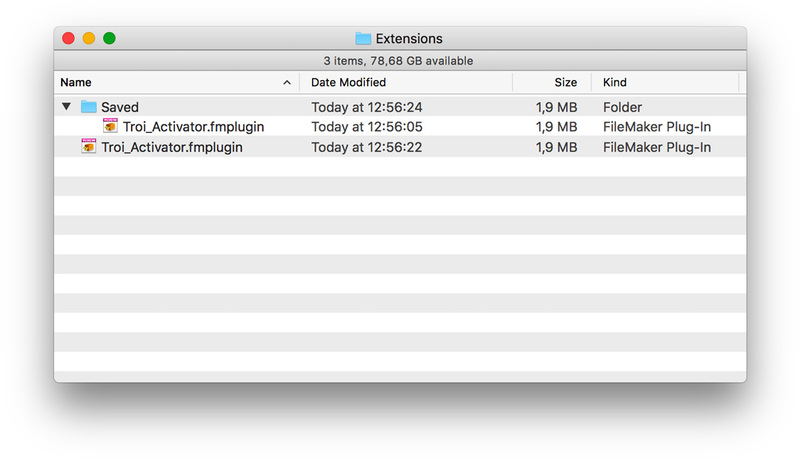 The plug-in folder has as name “Extensions”, and each version of FileMaker Pro has a separate folder. In the Extensions folder locate Troi_Activator.fmplugin and remove it from this folder. If there is a Troi_Activator.fmplugin in the ‘Saved’ subfolder, you can delete this too. Now open the EasyInstallTroiPlugins.fmp12 from the download package of Troi Activator Plug-in. Install the new plug-in by clicking on the “Install this Troi Plug-in” button. The Activator Plug-in should now be updated to the newer version.